The four Mounds of Krakow are forever inscribed in the landscape of the city and its surroundings. Two of them were built to commemorate Polish national heroes – Tadeusz Kosciuszko and Jozef Pilsudski. The real purpose of the other two’s creation – Wanda and Krakus Mounds – remains a mystery. Today, they are a tourist attraction and great places for Sunday walks, but their origins are completely different. Erected in the form of truncated cones of different sizes, they date back to prehistoric times. Such mounds are believed to had been burial sites and places of cult, observation and defense against invaders. In later centuries, mounds were erected rather as a way to commemorate important historical figures or events. Kosciuszko Mound was constructed for the national hero. Between 1820 and 1823 an artificial barrow was erected, modelled after the prehistoric Krakow mounds of Krakus and Wanda. The Mound was to serve as an everlasting commemoration of Tadeusz Kosciuszko, one of the greatest Polish heroes, widely respected across the world. People from all social backgrounds and Polish territories under foreign occupation, contributed to creating the memorial of Tadeusz Kosciuszko. Initially, the grounds around Kosciuszko Mound were planned to be turned into a colony settlement for the peasant families that fought alongside Tadeusz Kosciuszko in the uprising of 1794. In the late 1830s those families begun to settle at the foothills of Kosciuszko Mound, but the process came to a halt when Austrian authorities decided to turn this area into a part of city’s fortification. After World War II, the demolition of the former Austrian fort begun, motivated by the need to obtain building materials and to obliterate any memory of the occupiers. Demolition works lasted until 1957, but due to the unprofitable nature of the project, were soon abandoned. There were several concepts of how to develop the former fort. In 1977, the hotel was established and at the beginning of the 1990s it became the seat of a radio station. 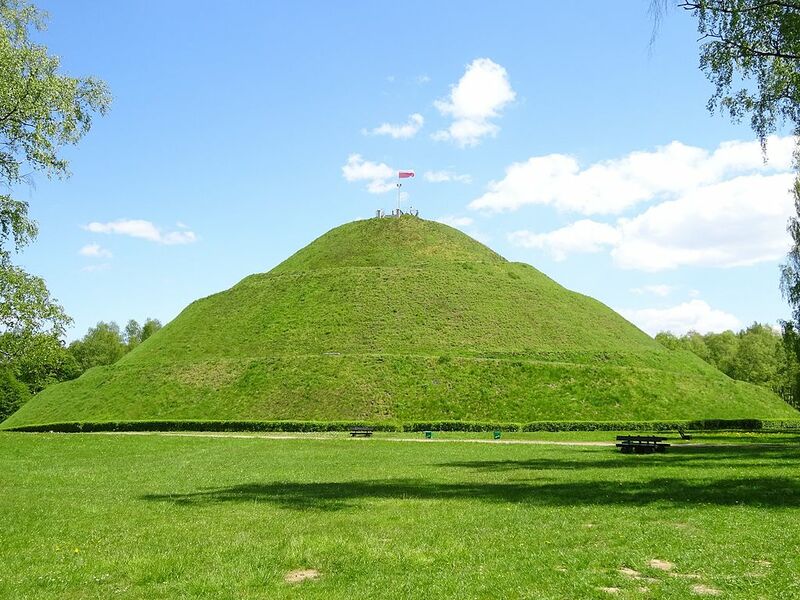 Today Kosciuszko Mound is a peculiar attraction of Krakow. From the top the visitors can admire beautiful panorama views of Krakow. The former fort also houses a museum dedicated to Tadeusz Kosciuszko. 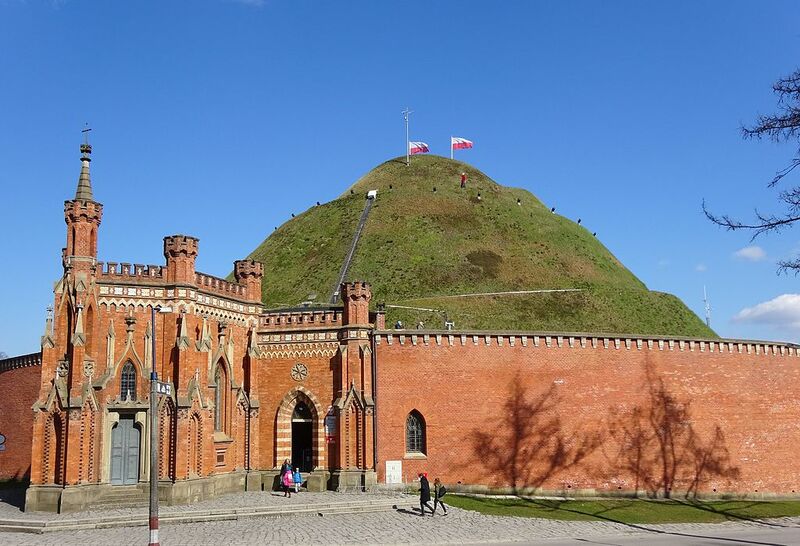 Krakus Mound is one of the two that probably predates even the Polish state. The circumstances of how and when Krakus Mound was constructed are unknown. Archaeological research had been conducted several times in Krakus Mound, resulting in excavating many valuable artefacts on different ground levels that were used to try to determine the Mound’s origins. Some hypothesis says that it is possible that the Mound dates back to as early as around 500 B.C. 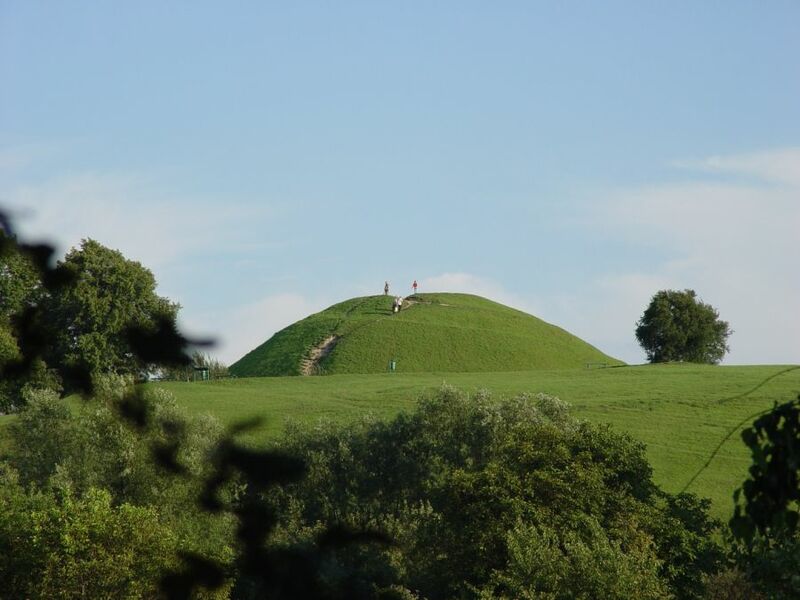 The most widely acknowledged hypothesis is that the Mound was erected between the 6th and the 8th centuries. Probably a tree grew at the top of the Mound and served as an important cult site. 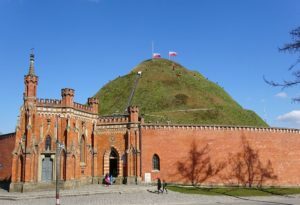 According to some researchers, Krakus Mound was a burial site of the legendary Prince Krak, who freed the people of the terrorising Dragon that had lived under Wawel Hill. Today’s name of the Mound refers to the legendary ruler. Perhaps, also a few other burial mounds were erected around. 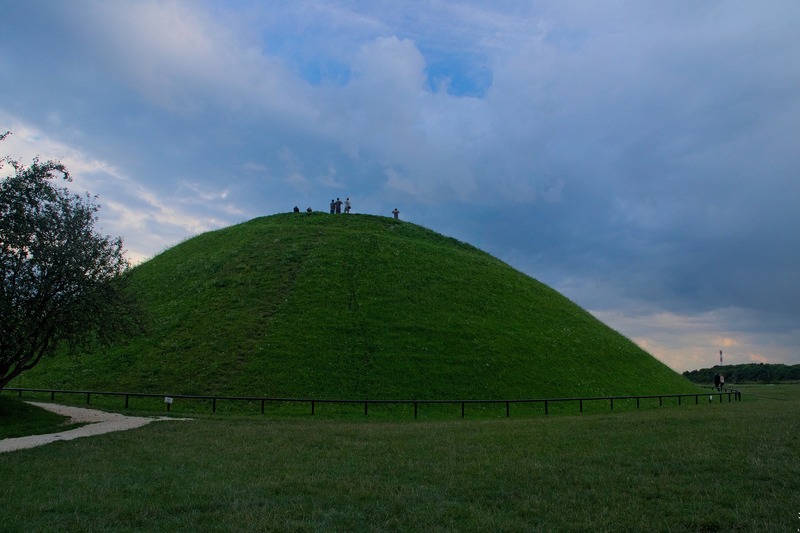 Krakus Mound together with Wanda Mound might also have been used as astronomical points. In the 19th century, the Mound was interpolated into the Austrian fortification system. Today, Krakus Mound is one of the trademarks of Podgorze district and is often chosen as a destination for spending free time with friends and family and admiring the panoramic view of Krakow from the top. In good weather conditions, visitors can see Wawel Royal Castle, St. Mary’s Basilica and even Nowa Huta district. Wanda Mound is the most mysterious of all Mounds of Krakow. It is said that the Mound was a burial site of the legendary Princess Wanda, daughter of the brave Prince Krak. Upon her father’s death, she became the ruler. Because she refused to marry a German prince, her lands were invaded by the troops of the offended admirer. Wanda proved to be an excellent commander and her army fought off the attack, but she decided to commit a suicide in order not to provoke the invaders anymore. Wanda Mound is located in the today’s district of Nowa Huta, around 10 km from Krakow Old Town. In the past, it was a pristine settlement, where people had long cultivated pagan beliefs until the Cistercian Abbey was built nearby the Mound in the 13th century. Very little more is known about Wanda Mound. 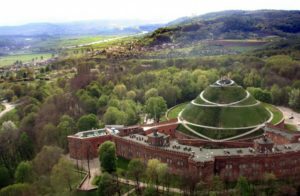 In the 19th century, just like Krakus Mound and Kosciuszko Mound, it was an element of the Austrian fortification system. It is believed that together with Krakus Mound it created a line of astronomical and cult sites of pre-Christian settlements. In 1890 at the top of the Mound a monument of a white eagle designed by Jan Matejko was placed. Wanda Mound is yet another peculiarity of Krakow, interestingly contrasting with the socialist realism of Nowa Huta. Pilsudski Mound is the highest of all Mounds of Krakow but also the biggest of all mounds of this kind in Poland. In 1934 the combatant organisation of Polish Legionaries came up with an idea to commemorate Polish struggle for independence by creating a mound. The works began the same year. After the death of Marshal Jozef Pilsudski in 1935, the leader of rebuilding the Polish state after World War I with high esteem among civilians and military, it was decided that the new mound in Krakow should bear his name. The soil from all World War I battlefields, on which Poles fought was laid in the Mound. During World War II, Nazi general governor Hans Frank gave the order to tear down Pilsudski Mound but it was eventually not executed. After the War, the communist authorities made every effort to belittle Pilsudski’s impact on creating the independent Polish state during the interwar period and to denigrate Pilsudski himself. In 1953 a plate with a legion cross engraved on it was removed from the top of the Mound with a tank. The entire hill of the Mound was then destroyed. Since 1980, the Committee for the Preservation of the Mound has been overseeing its renovation. Pilsudski Mound is surrounded by the beautiful Wolski Forest and Krakow Zoological Garden is located nearby. It is a green enclave not so far from Krakow Old Town, what makes it a great place to have a day off. Hi Ana! Krak mound and Kościuszko mound are the best choices for drivers, as you can leave your car at their foot. These are also the closest mounds to the city center.However, if you don’t have much time and want to see more than one mound, maybe you should try visiting Kościuszko and Piłsudski mounds? You can easily get from one to another with your car (around 15 min) and at the same time discover one of the most picturesque areas of Kraków – Wolski Forest. There is also Krakow ZOO located between them, where your can leave your car to climb Piłsudski Mound.Hope you’ll have a great trip in Krakow and a perfect weather at mounds’ peaks!